Zimbabwean-born Pocock had long been ear-marked for big things before he made his Wallabies debut against the All Blacks in Hong Kong in 2008. A former Australian Schools, U19, U20 and 'A' international, Pocock's selection for the Wallabies came six years to the day after his family had arrived in Australia after farewelling their cropping farm in Zimbabwe. Pocock had a breakthrough year in 2009 during which he featured in 13 of the 14 Tests played by Australia including a man of the match effort in the drawn Test against Ireland at Croke Park, as well as a maiden Test try during the 33-12 win over Wales at Cardiff. The openside had earlier started the year by scoring his first try for his adopted country during the 55-7 win over the Barbarians in a non-cap match at Sydney. He was also a key figure in the 21-6 win over South Africa at Brisbane, out-gunning the much vaunted loose trio of the world champions at the breakdown. He cemented his place in the Wallabies' line-up in 2010 - taking a starring role in their opening Tri-Nations victory over South Africa in Brisbane. 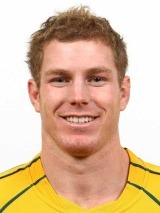 And his outstanding form was rewarded with the John Eales Medal as Australia's Player of the Year. His World Cup preparations were dealt a blow in 2011 with a knee injury sidelining him during the early stages of the Super Rugby season. Pocock made his Super Rugby debut for the Western Force in 2006 and cemented his place in their squad the following season. He enjoyed another industrious season in 2008 during which he stepped up to the captaincy plate, firstly leading Australia to the IRB Junior World Championship, before also taking the leadership reigns on the Western Force development tour of the United Kingdom. After recovering from his knee injury - Pocock forced his way back into Wallabies reckoning in time for the World Cup and took his bow in the tournament against Italy before appearing against Russia where he ran in two tries in the process. He was an integral part of the side which despatched the 2007 World Cup holders South Africa in the quarter-final stage putting in a truly memorable shift in the seven jersey. In July 2012 Western Force announced that Pocock would be leaving Super Rugby franchise before joining the Brumbies.